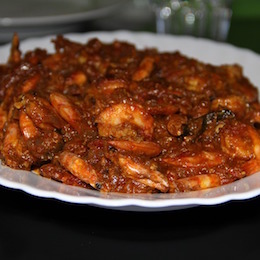 This quick prawn curry is so easy and straightforward. You could use any fish in it to be honest, just cube it and simmer for around five minutes. 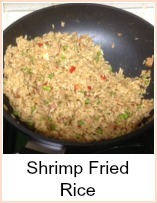 Neither prawn (shrimp) nor fish need a long cooking time. If you cook prawns for too long, they go tough. If you put some rice onto boil before you start cooking your curry, then you should have them both ready at the same time. Add some warmed nan bread, some chopped onion, cucumber and tomato salad, a minty yoghurt dressing and you've got a real feast. You will need to prepare your salad and dressing before you begin cooking the curry. Heat the oil in a pan and fry the onion for around 5 minutes until soft and golden. Add the curry paste and yoghurt and simmer for around 5 minutes. Add the defrosted prawns (shrimp) and simmer for 2 to 3 minutes. Serve the curry over boiled rice with a few coriander leaves sprinkled on top. This is so simple and you can use any type of curry paste you prefer - mild or strong. I like madras as it gives a medium heat, but the yoghurt in the sauce cools it a little to make it less fierce. 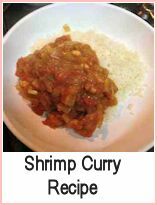 You'll love how quick and tasty this shrimp (prawn) curry is.